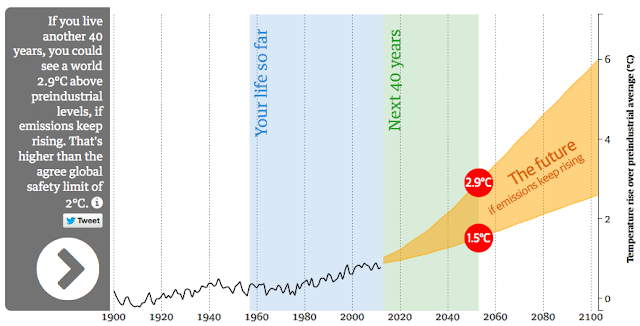 COMPASSIONATE CLIMATE ACTION: Compassion Tune-Up: How Hot Will It Get in Their Lifetime? Compassion Tune-Up: How Hot Will It Get in Their Lifetime? How how will it get for a child born today? Every time I turn around, I read or hear "two degrees." Two degrees this, two degrees that. Two degrees has wormed its way into our climate-changed brains as though it's a goal or a target we're aiming for, instead of a temperature rise we don't want to go near. The Independent: "A rise of two degrees centigrade in global temperatures [is] the point considered to be the threshold for catastrophic climate change ...."
The Conversation: "Two degrees [is] the temperature rise we need to stay under to avoid catastrophic effects of climate change ...."
European Union: "Limiting Global Climate Change to 2 Degrees Celsius"
The Guardian: "... the agreed 'safety' limit of 2ºC." I've talked before (here and here) about the ill wisdom of setting 2ºC as some sort of guardrail, especially when we've got a bunch of yahoos driving the global go-karts. "Guardrail? Yeehaw, let's go for it!" Considering what's happening already with only an additional 0.8ºC of warming, how could anyone wish 2ºC on their progeny and descendants? Having said all that, if one recognizes the catastrophic danger that continued global warming poses, then one might find The Guardian's interactive How Hot Will It Get in My Lifetime? of use as a compassion tune-up. For example, here are screenshots for my birthdate versus the birthdate of my beloved niece. 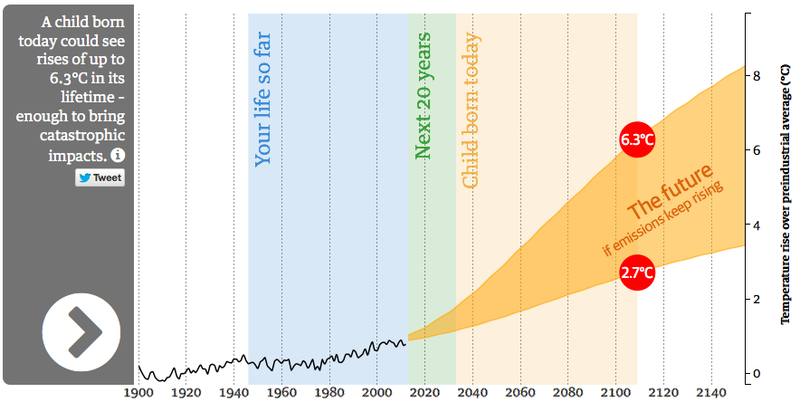 This helps me see that it's all inexorable without a huge push for zero carbon emissions. 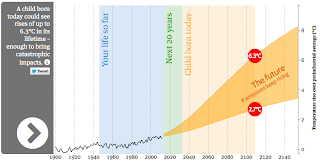 On current emissions trends (which show no sign of slowing, let alone stopping), when my niece reaches my current age in 2048 (and I'm in the ground or in deep decline), we'll have blown past the 2ºC "guardrail" and will be heading to over 6ºC of warming. By the way, here's how I look at that best-case lower limit of the range of warming. If emissions keep rising and the global temperature keeps going up, then there is no "best case." It's just a matter of the speed at which we're committing this greatest of crimes against humanity: progenycide.